Fresh from the Bachelor New Media at the UvA, Jorien likes to specialize herself during the Master in the anatomical and physiological effects of New Media on the human brain. To gather the required knowledge to make sensible statements about this she combines New Media with the Bachelor Psychobiology. This way she hopes to develop a broad, interdisciplinary frame of knowledge to conduct fundamental research. When I saw my little niece getting read aloud by my uncle’s iPad, I wondered how this could affect the way she is being raised. If iPads and other digital devises take over the task of parents, would it cause the alienation of children from their parents? Global debates are being held about the emergence of machines in our every day life. Countless theories are proposed about the future of cybernetics and man-machine interaction. But what if we take into account that children nowadays are raised surrounded by computers from the day they were born? I think the consequences are unthinkable for everyone over 10 years old. This change might not take place in the near future. Bol.com (the Dutch Amazon) only sells eBook that have a blocked voice over feature. In this way, it is not possible to activate the read aloud function on your Personal Computer and Mac. The Authors Guild protested against Kindle, a software program that introduced the voice over reading of texts. E-books could be read aloud by a computer voice with Kindle. The Authors Guild decided that this equalled the audio books that are for sale on CD’s, and Kindle violated the copyright of the authors. Because of this dispute, Amazon let authors decide whether they would like to activate or block the voice over feature on their eBook. For the record: Amazon also owns Audible, an audio book web shop. 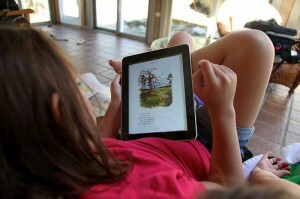 The audio feature for eBooks is still active on the iPad, so my niece will still miss her warm, physical bedtime story. I wonder how long it takes until The Authors Guild find their way towards Apple. « Will our gadgets ever really converge? Alice in iPad, the New Wonderland.